The global paraxylene market features an increasingly fragmented landscape on account of the leading companies accounting for a scant market share, finds Transparency Market Research (TMR). The top three players—BP plc., S-Oil Corporation, and Reliance Industries Limited, held a share of just 12% in the global market in 2015. TMR notes that a large part, estimated at around 85%, of the global production of paraxylene is contributed by small firms and subsidiaries of large chemical manufacturers. A growing number of manufacturers are focusing on forward integration moving down the supply chain which is most likely to up the level of competition in the market, observes TMR. The global paraxylene market stood at US$33.03 billion in 2015 and is projected to reap an opportunity worth US$60.04 billion by the end of 2024. During the forecast period of 2016–2024, the global market is projected to expand at a CAGR of 7.0%. The various applications of paraxylene are in the manufacturing of purified terephthalic acid (PTA), dimethyl terephthalate (DMT), solvents, pesticides, and coatings. Of all the segments, the purified terephthalic acid segment dominated in 2015 accounting for a share upward of 97%. The application is expected to churn out vast lucrative prospects throughout the forecast period, on account of its uptake in the PET industry. On the regional front, Asia Pacific has emerged out to be the most attractive market accounting for a mammoth share in the global market. The growth will majorly be fueled by the extensive demand in China and its usage as raw materials for PET for the food and beverages packaging industry. The substantial usage of paraxylene in making PTA which is a key raw material for making PET provides a robust underpinning to the rapid expansion of the market during the forecast period. The widespread uptake of PET in numerous applications in the textile industry is a key factor boosting the market. The usage of paraxylene in manufacture of furnishings, technical textiles, and clothing, is substantially adding to the overall global revenues in the market. The attractive growth of the market will be sustained by the rapid strides being taken by the textile industry across the globe. The vast consumption of PET containers among people, especially in developing regions of Asia Pacific, is accentuating the market growth. The rising uptake of PET containers, attributed to them being considered safe and economical, in the food and beverages industry is boosting the market. The widespread uptake of polyester in the textile industry world over has bolstered the demand for paraxylene. However, in the light of the emerging evidence that the use of non-biodegradable plastics may pose substantial risk to human health and the environment, the demand for certain types of plastics has taken a considerable beating in recent times. This has suppressed the demand for paraxylene-manufactured products such as PTA. Coupled with this, the glut of supply of paraxylene, notably in Asia Pacific, has also adversely affected the growth of the market. Developed economies, such as in North America and Europe, and several developing countries are strictly enforcing the curb on plastic usage. This has also crippled the uptake of paraxylene in the plastic manufacturing industry. The emission of toxic byproducts in the production of polyethylene terephthalate containers is also hampering the consumption of paraxylene. 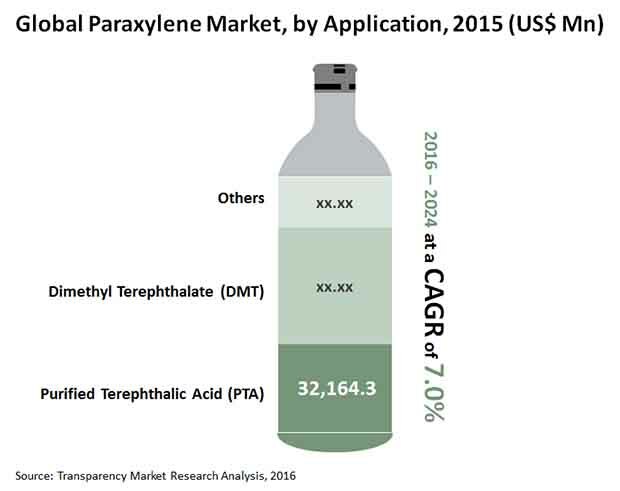 Nevertheless, the paraxylene market is expected to witness growth from the rising demand from the textile and packaging industries. The study presented here is based on a report by Transparency Market Research (TMR) titled “Paraxylene Market (Application - Purified Terephthalic Acid (PTA), Dimethyl Terephthalate (DMT), Coatings, Pesticides, and Solvents) - Global Industry Analysis, Size, Share, Growth, Trends, and Forecast 2016–2024”.